If you are tired of sandwiches for your brown bag back to school lunches, get a bit creative this fall using some of the wonderful recipe ideas suggested in “175 Best Mini Pie Recipes” Sweet to Savory cookbook from Julie Anne Hession ( www.robertrose.ca). Many of the recipes can be prepared ahead of time and then frozen for later baking, so you can whip up a batch and then parcel them out into your lunch bags and boxes throughout the week. In addition to hand held pies, there are recipe suggestions for tarts, phyllo dough pockets, phyllo dough triangles, filled puff pastry and pie pops that will be a big hit with the kids. The sweet and savory fillings range from traditional fruits and flavored creams to seafood, meats and vegetables. 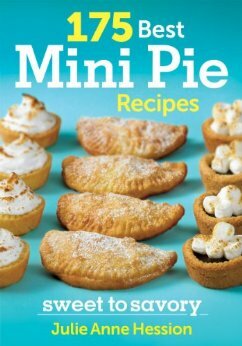 “175 Best Mini Pie Recipes” by Julie Anne Hession – Gotta Love It!